Hello folks. I’ve been away for a couple of weeks, nice to be back in the headline saddle. 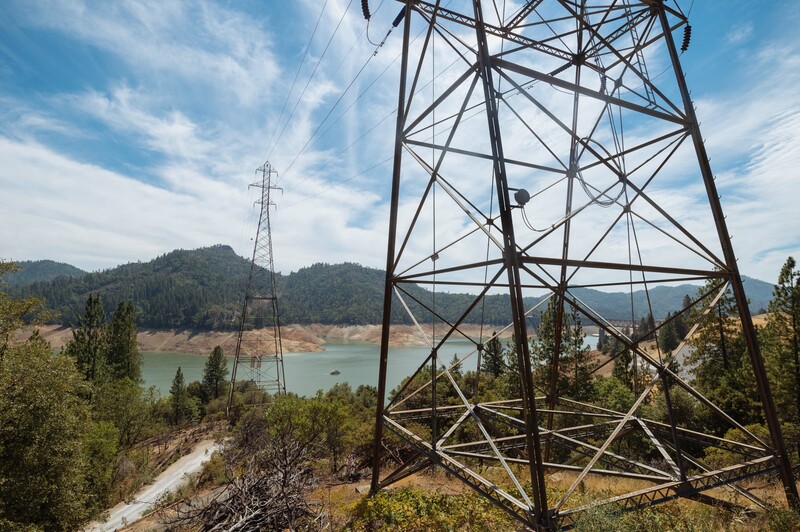 I’ll offer up a couple of Art of Transit photos from Redding and nearby Shasta Lake in NorCal. 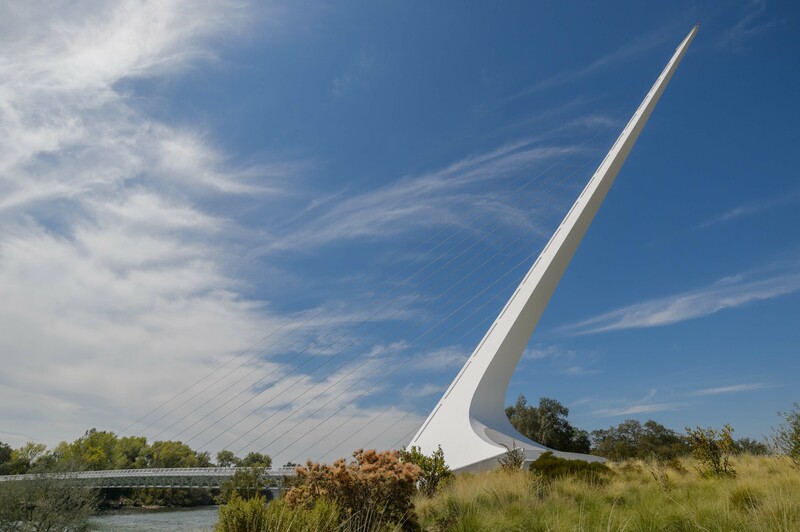 The first is the Sundial Bridge over the Sacramento River in Redding — a pedestrian bridge designed by well-known architect Santiago Calatrava, who has done impressive work on train stations around the world (including the new PATH station under the World Trade Center site in New York). It’s impressive that a city the size of Redding (about 91,000 at last count) was able to secure Calatrava’s services and get the bridge built. Hopefully Los Angeles’ new Sixth Street Viaduct matches the beauty and impressiveness of the Sundial Bridge, which is helped by the fact that it’s in a park and that the Sacramento River flows well most of the year due to releases from Shasta Dam. And, now, onto the headlines. It will probably take me a few days, as usual, to catch up with the news. Thanks for your patience! Local transportation officials and politicians used the recent Mobility 21 conference to talk about the best way to spend the money generated by the state’s cap-and-trade system. Los Angeles Mayor Eric Garcetti is quoted saying he would like to see the funds used to help pay Metro operating expenses to keep fares low in the future (Metro’s fare increase/changes begin Sept. 15 but the Metro Board decided earlier this year to hold off on increases in 2017 and 2020 pending more study). Of course, $2 billion is a lot of money — but there are also a lot of transportation needs around the region and state, as the article notes. Meanwhile, the federal government is looking into more toll roads as a possible way to deal with a stagnant federal gas tax and a Highway Trust Fund that could be on shaky ground after May, when the latest short-term fix expires, according to USA Today. We want to start telling you our story. We want to bring you the insight and expertise of our colleagues. We also want to give you an inside peek into the SFMTA, with the hope of making the transportation system easier to understand and easier to use. A full 25 percent of our city’s public space resides in our sidewalks and streets. In a dense, rapidly growing city, such as SF, transportation issues are complex. We hope the additional information, discussion and explanation we provide will expand the conversation. This blog will not be a repository of press releases or official messages, and, indeed, this space won’t be very useful for specific complaints (those need to be tracked through 311, please). Expect us to evolve over time, but we will strive to be timely, informative and worth your while. We’ll be taking cues from your comments and feedback, so we’re eager to hear back from you on what you want to learn more about here. I think it’s great. As I’ve said many times before, government should never be the only source of news about government — that’s why it’s important to have a vibrant, well-funded media. That said, I believe the government is obligated to push information to taxpayers and blog such as these help do that. Obviously this raises the question of whether smart phones will ever be used to pay transit fares in our region as an alternative to TAP cards? The short answer: we don’t know. I do know, however, it’s something that Metro Board Chair Eric Garcetti has asked the agency to study. I saw the dangerously low level of Lake Shasta on my trip to Washington last month. It really hit home just how intense this drought is. It’s pretty amazing that it was actually lower in ’76-77. Hard to say how dangerous it is. I heard the expected El Nino for California this year isn’t looking so good — but at least not a La Nina either. Certainly underscores the need to save water. It was also interesting to see so many farm fields that hadn’t been planted along the 5 freeway south of the Bay Area. Mr. Calatravas work is well know all over the world for its beauty, but one of his problems seems to be that he is always over budget in the design and construction phases, and I have read that some of them are actually falling apart.